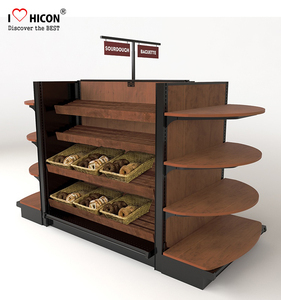 bakery display cake rack wooden bread shelf Hibright Company has great experience for all kinds of wooden display products such as wooden gondola shelving , bread and cake rack, wine rack. For bread and cake rack , we have A,B,C,D four standard series, all series has great flexibility which allow you choose different size, color , wood and accessary. Upon customer's demand, attempts to offer a free store design service makes several clients so exciting, which help us to expand to one-stop solution supplier after 13 years growing. Generally ,chrome plated shelves is better for dry environment use ,while powder coating or zinc plated covered by epoxy finish is better for wet enviornment use . 2, What about your lead time of a container order 9 Answers : Generally 30 days for first order and 25 days for repeat order if your order are our catalog items. 4, Can you make customized design wire shelves9 Answers : Of course yes ,we are professional of the manufacture on steel wire and round tube products . This is a large wooden slat bread display shelf. This wood retail shelving features a wooden slat design inspired by rustic bread cooling racks from yesterday. The wood slats are custom stained from AX Display. 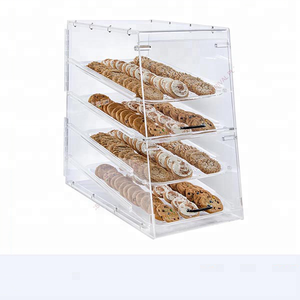 3)clear acrylic so customers can easily see (and smell) your selection of cookies and pastries. 4)Take advantage of impulse sales and this bakery display case will pay for itself! Our company promises:reasonable prices,short production time and satisfactory after-sales service. Term of Payment Trade Assurance , T/T , Paypal , Western union , L/C at sight , Cash , etc. Advantages Professional supplier specialized in Home organizer , Stationery. Product Package Every product is with a high-quality polybag,then put into a gift box. 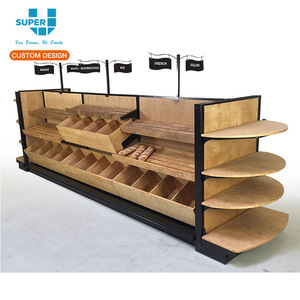 Alibaba.com offers 2,258 bread display shelves products. About 54% of these are display racks, 23% are supermarket shelves, and 5% are stacking racks & shelves. 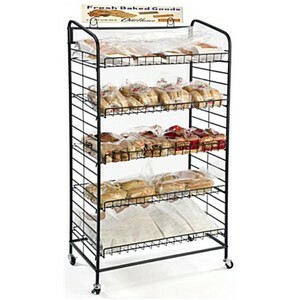 A wide variety of bread display shelves options are available to you, such as metal, wood, and paper. You can also choose from free samples, paid samples. There are 2,181 bread display shelves suppliers, mainly located in Asia. The top supplying countries are China (Mainland), Hong Kong, and Turkey, which supply 97%, 1%, and 1% of bread display shelves respectively. Bread display shelves products are most popular in North America, Domestic Market, and Western Europe. You can ensure product safety by selecting from certified suppliers, including 492 with ISO9001, 109 with Other, and 73 with ISO14001 certification.